My new life begins at LAX a journal of my 3 months living and working in Phnom Penh, and beyond. 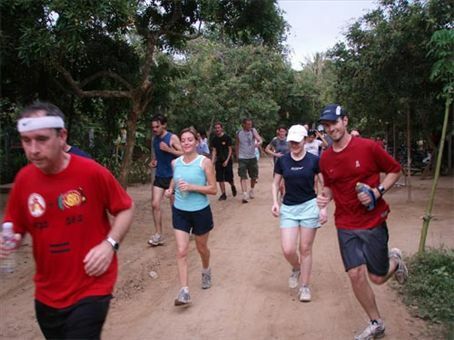 I had heard of the Phnom Penh Hash House Harriers (P2H3) on my previous trips to the city. I always wanted to meet up with them, but the other times I was here things were always kind of hectic and I was never able to do so. In case you have never heard about the Hash House Harriers there are a international running club, sort of (their motto is they are a drinking club with a running problem) with chapters all over the world. Some of the people at yesterdays Hash were wearing shirts from the Laos, Vietnam and China H3. I know they also have clubs that meet in the States as well. I saw there was an OC club a while back and meant to meet up with them but never did. So anyway I checked their website and found out that they meet at the train station on Sundays at 2:45 and the cost for the Hash is $5. I was put off by the $5 and almost didn’t go because of it, $5 can get you a lot in PP and I wasn’t sure if it was worth it just to go running with a few ex-pats. I decided to give it a shot anyways, I might meet some cool people and find out about things going on around town. My expectations for the hash was that we would pretty much just go on a run from the train station for about an hour, and then drink a few beers. The actual hash far exceeded my expectations. We all got in the back of a long bed truck and drove to a location about 30 minutes outside of the city. There was about 50 harriers standing in the bed of the truck (about 40 ex-pats and 10 Cambodians). This is a common mode of transportation around Cambodia, although it is rare to see any westerners traveling this way. We got a lot of looks just driving around in PP. The further we got out of the city the more looks and smiles we got. I don’t remember the name of the name of the place we went, but it was the province to the South of PP I believe. When we arrived at the meeting point we got out of the Truck were encircled by a group of Cambodians trying to figure out what the hell we were doing. Once everyone was organized we took a Ferry across the Mekong river to a small island where we would be running. They went over the rules for the run and we began. The run itself was a lot different then I had expected as well. From the start we didn’t know which direction to go, the intersection we were at went 3 ways. Some of the harriers had come earlier and marked the trail with spray paint. 3 white dots in the same direction meant it was a good trail. If you found one dot you were supposed to say “On one”, two dots “On two” and 3 dots “On On!”. To make things fun there were lot of fake trails with two dots that people would run down for a while before they heard “On On” from another direction. About every Kilometer or so there was a circle with an H in it also known as a Hash Hold, where everyone would stop and wait for the slower runners. The run itself was beautiful, we were running through small farms on a variety of terrains, never quite sure if we were going the right way. I met some really cool people there. One of the first guys I met Tim an American who writes for the Cambodian Daily, bashed his head pretty hard into a tree and was bleeding. He was the only casualty of the day. Afterwards we all met the starting point where a cooler waters and Anchor beers were waiting for us. They went through a bunch of phony ceremonies and sang some songs they all knew. Since I was a hash virgin, they made me chug a beer with my left had. This was the 859th meeting of P2H3, I am sure that I will come to many more Hash’s while I am staying in PP, and wherever I go afterwards I will check for Hash’s. yeah, this one caught me off guard. Did you guys run in the shape of giant (golden) triangle? this sounds like way too much fun and a great excuse to partake in other substances of a hoppy kind. Regarding Excellent Choice from KL, P2H3 is one of the best H in the World. So you are lucky man!